I prefer reporting about products I’ve found that really do me some good or save some money or something nice. But when I find a product that just doesn’t seem to be worth buying, I feel I should share that too so you can benefit from my experience. Of course, as with products I’m comfortable recommending, the fact that something didn’t work for me doesn’t mean it won’t work for you. I’m just telling you my experience. I took that scale back and bought another Taylor in its place – a different model. The exact same problems occurred: sometimes it wouldn’t come on at all, other times it came on of its own accord and stayed that way for hours. Two different models from the same company having identical problems was enough to convince me that maybe Taylor scales just aren’t very well made. Has anyone else had any experience, good or bad, with this brand? I’m glad to see this review. I have a Taylor scale and came in the bathroom and it lit up on it own. I’m glad you see this is a known issue. 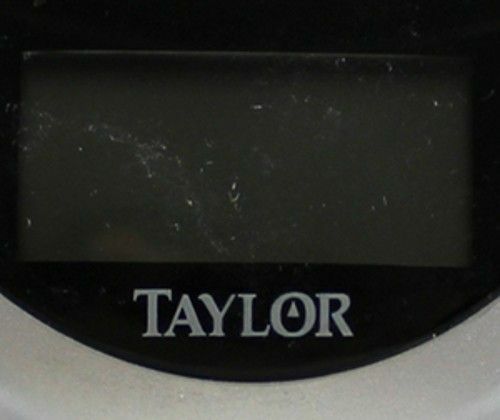 I’ve had multiple problems with my Taylor and replacement Eat Smart scales. The first just stopped working after briefly having the same issues above. The replacement scale stopped calculating body fat etc… it also would fluctuate 30-40 pounds. I was beginning to think I was ill. After mysteriously dropping 5-10 pounds in less than a day. I’m now on my third scale in less than a year. I don’t know. I think it’s probably broken, but I don’t know how to fix that. Well, I have a model 7542, it may be an older model (I can’t find it anywhere), and I don’t have exactly the problems you report with mine. But, if I step on with my left foot, it gives a different reading than if I step on with my right. If I step on a second time, I get a new reading. These sometimes vary by almost 10 pounds! And now, it won’t even settle down on a number, but keeps jumping around and finally says, “Err” and goes off. I finally gave up and chucked the thing and got a new one. Taylor is never getting my business again. What an inferior product. My model 5739EF never really worked well, even after placing it on a level tile to ensure that all supports were simultaneously engaged. Problem is I just threw it to one side and never thought of returning it for a refund. It’s a shame that Costco would sell such a poor product.